The Genie® Lift™ SL25 model comes with standard forks (Net weight 17.2Kg) which allows one person to manually hoist 295Kg to a maximum height of 7.4 metres. 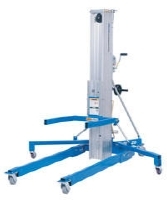 The Genie® Lift™ is ideal for a wide variety of tasks from lifting heavy material to or from shelves to Lifting equipment/computer products in retail stores. Why not give us a call and speak to our friendly customer service team.